Contest! Win Orko or Plastic Man in the AFB SDCC 2010 Contest! There has to be some benefit to getting up at 2:00 in the morning to face the White Screen of Death, doesn’t there? AFB managed to resist the temptations of a warm and cozy bed to stay up long enough to get some post-SDCC spoils from Mattel, and while I was there, I decided to try to help out my fellow collectors by grabbing a couple extra to share. 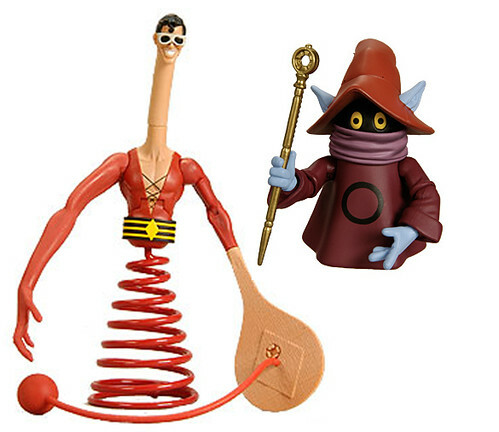 As such, we at the AFB Forum have one each of the Mattycollector.com versions of the sold out Masters of the Universe Orko (regular version with Prince Adam pack-in) and the DC Universe Classics Plastic Man (sans suitcase) to give away to two lucky action figure fans! But hey, winning prizes as great as these requires a little bit of work, right? If you’d like to enter to win, you’re going to need to put together either an “Ode to Orko” or a “Plea for Plastic Man”. This could be in the form of a verse, song, graphic, video, whatever you choose, as long as it’s safe for work and entertaining, because the best Ode and Plea, which will be the ones our panel of judges (the three other AFB Forum admins: FB, fishmilkshake and dozymuppet) find the most amusing, will be selected to win the respective prize for that category. To enter, go the Ode for Orko and Plea for Plastic Man threads at the AFB Forum, and post your entry. You can enter both contests, but to keep it fair there will be different winners for the two separate prizes. There is also a general thread for the contest to answer any questions, etc. We hope you enjoy this chance to win one of these two great items, and we’re sure we’ll all have some great fun along the way! Start getting your Odes and Pleas together – the competition closes on 20 August, 2010! Have fun, and remember you can also comment on this post for a chance to win the AFB August Comment of the Month Contest! Very cool of you to do, Andy. Managed to order Plas, and wasn't too fussed about Orko, so I'll probably sit this one out. ooh exciting. let me have a think. How shall I word this? Hmmmmmm. Thanks muchly for this great generosity. I will have to give this a thought. You guys are awesome. No, I mean really. And ORKO! I don't follow MOTUC news much so I didn't even know they made one already. Cool.